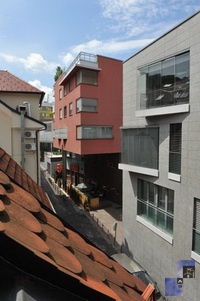 This modern apartment is located in the historical centre on Poljanska cesta, step away from river Ljubljanica and only 500 m from the main square. Modern apartment has two floors. 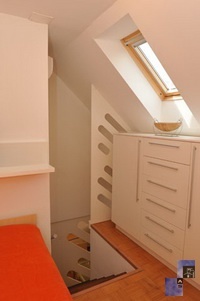 In the upper room, which is connected with lower living room with stairs, there is a wardrobe and one big bed (140 x 200 cm). 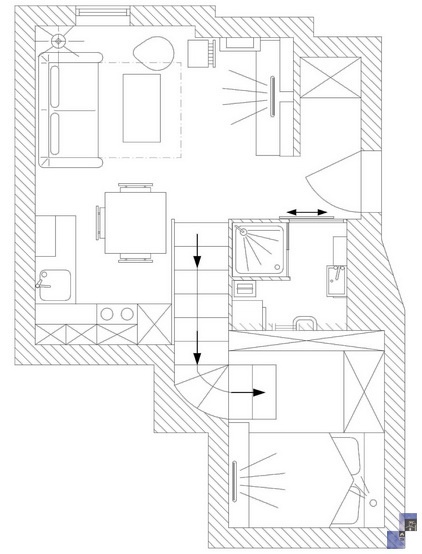 In the living room below which is connected with kitchen is a sofa which falls down to a bed (120 x 200 cm) and writing desk, functional kitchen with stove, oven, big refrigerator, dinning corner, bathroom with shower and washing machine. It is fully equipped with cooking utensils, cutlery, towels, linen, iron, ironing board, hair dryer, telephone, LCD TV, CATV, air conditioning and free broadband wired and wireless (Wi-Fi) internet access. Studio is on the 2nd floor without elevator. It is possible to park in the public garage approx. 150 m away from the apartment (only for personal vehicles that do not exceed the usual length of 5m and height of 2.1m) - daily price is from 10 €, monthly price is 160 €. Reservations must be made in advance. At monthly price, payment for the final cleaning at departure is obligatory (65 €). The Ljubljana tour with English and Russia speaking guide; 1-5 persons 80 €. That's brilliant thank you so much we have loved our stay and we are coming back next year for a week and we will be definitely be staying in your apartment I will leave you excellent feed back on trip advisor see you tomorrow thanks once again. 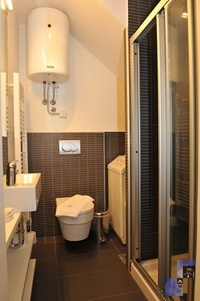 Lovely apartment, well equipped - the washing machine is a real plus!! The bed is very comfortable & so is the sofa. The location is perfect & the supermarket just around the corner is very handy. Although is a studio it has plenty of storage to keep it clutter free. We were very happy in our stay. Thank you! !